Happy National S’more Day! 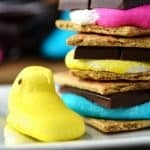 This has got to be my number one favorite food holiday. You can’t go wrong with an ooey gooey s’more! 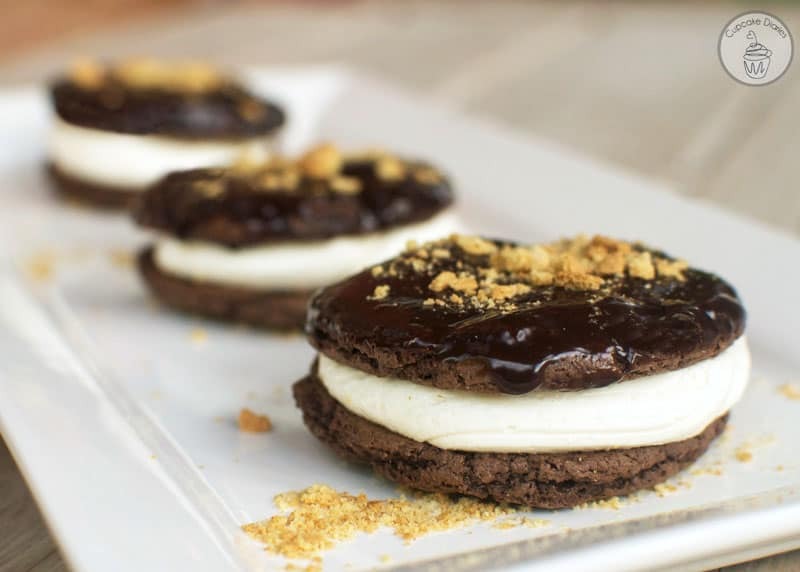 I decided to take the classic s’more to a different level and made these decadent S’more Whoopie Pies. 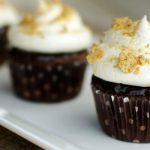 Two chewy chocolate cookies with a layer of creamy marshmallow buttercream frosting topped with a smooth chocolate ganache and crunchy graham cracker crumbs. You have GOT to try this treat! Make these and your friends and family will think you got them from a bakery. They’re pretty fantastic! I feel like a kid biting into one of these whoopie pies. And you’re going to love how easy they are to make! Place cake mix in a large bowl; add cooled butter and whisked eggs. Mix dough with wooden spoon or hands till it comes together. Use a cookie scoop to form dough into 1-inch balls. Place on an ungreased cookie sheet and bake for 9-11 minutes. Transfer to a wire rack and allow to cool completely. Prepare ganache by placing heavy cream in a sauce pan and chocolate chips in a glass bowl. Bring heavy cream to a boil over medium-high heat, stirring to avoid scalding, and pour over chocolate chips. Allow to cool for 10 minutes. Add salt and whisk together till nice and smooth. Dip the top of 12 cookies in the ganache to coat. Place back on the wire rack and add crushed graham crackers to the dipped part of the cookie. Prepare the frosting by placing the butter in a medium/large bowl. Beat the butter with a mixer until nice and fluffy. Add the powdered sugar about a 1/2 c. at a time till well combined with the butter. Then add the almond extract. Add marshmallow fluff and mix well. Press frosting down into the corner of the bag and pipe on the bottom of the remaining 12 cookies. 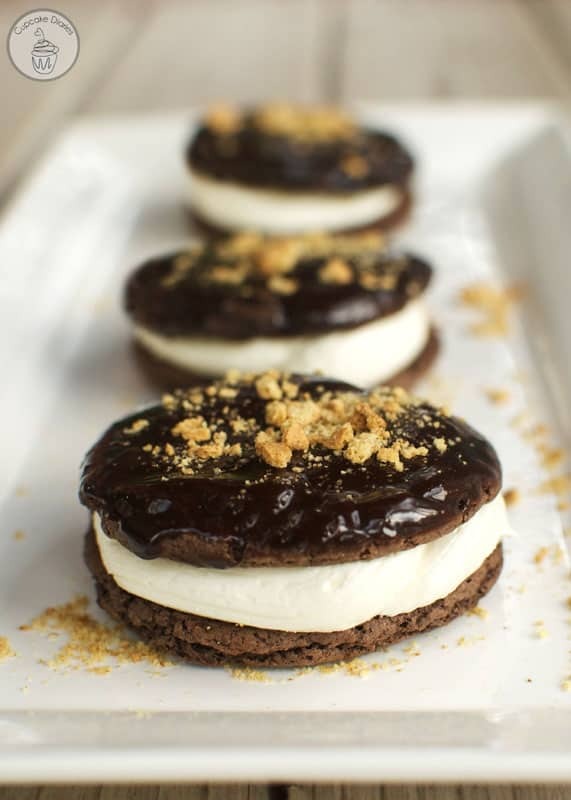 Cover with ganache-dipped cookies to form a sandwich. Allow ganache to cool before serving. Enjoy! It wouldn’t be a food holiday without more great recipe ideas! 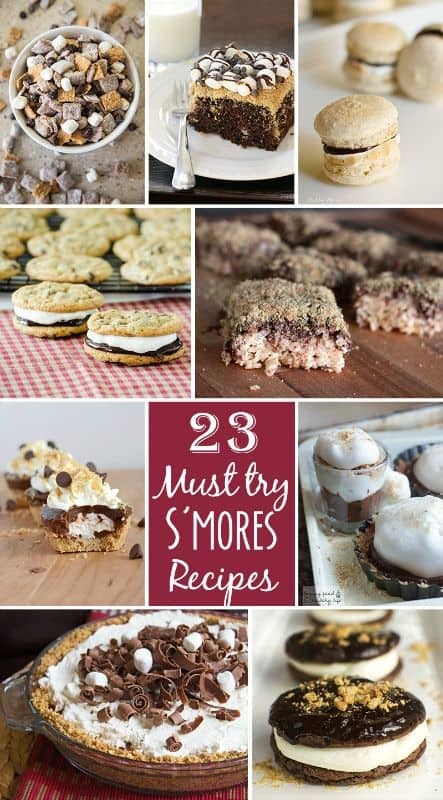 If you’re a fan of s’more desserts, you’re going to love this round up of decadent s’more treats. Yum! 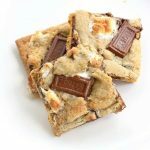 S’mores Pie from Jamie Cookies It Up! S’more Cookies from Jamie Cooks It Up! Caramel S’more Munch Mix from Jamie Cookies It Up!